In our 20 years of experience as a Dallas moving company, seniors seem to be one of the most targeted groups by scam “moving companies”. Most of these scam movers are online moving companies that set up quickly and begin marketing to get customers with very little experience, if any. They provide extremely low quotes to get consumers to choose their company, and when they show up with the moving load, the problems begin. -Taking longer than expected (by weeks or months) to deliver the truck- the industry average is 2-6 weeks. -Asking for substantially larger payment upon delivery-mark ups of hundreds to thousands of dollars after no changes were made during the move. -Using the consumers’ personal belongings, electronics, or other items. -Putting the consumer’s belongings in storage and keeping the key, or demanding a larger payment- additionally charging storage fees when the consumer never wanted their belongings in storage. –Stealing consumers’ belongings-consumers noticing items are missing as they unpack. –Damaging the belongings in the truck- items smashed, broken, unusable that were usable when packed. -Refusing to deliver without high fees-similar to mark ups, but perhaps no delivery at all until money is paid to make the move. It’s sad to think that people are out to scam others at their mercy, but it’s worse when they target a section of the population that is so vulnerable. In the rough economy so many seniors depend on a fixed income, with very little margin for savings and over spending. When a situation like this happens, they sometimes have to wait months to access their belongings because it can take so long to save money to pay the large up-charge for moving. Since situations like this are becoming more prevalent the government has performed an investigation and these moving companies will begin to face charges of up to $10,000 per day for holding a consumer’s belongings hostage, once bills are put in place. Overall these changes should discourage people from opening their own shady moving companies, and increase the integrity of the industry again, making everyone look better, and increasing satisfaction rates. If you have any questions about these changes, please let us know, we are glad to answer your concerns, and tell you more about how we can help. 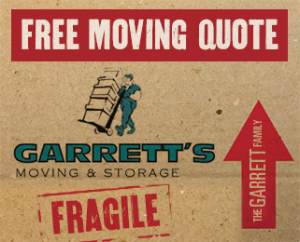 Garrett’s Moving and Storage is a Dallas moving company specializing in senior moves. We have over 20 years of experience of moving in Dallas and across the country, and we are BBB accredited so you know your belongings will be in good hands. We also have a best-in-the-industry extended coverage policy. Contact us today at 972-487-5843 for a free estimate or click here to request a quote online from the leading Dallas moving company.